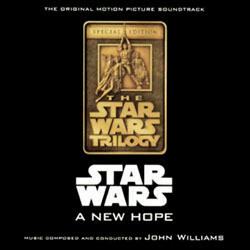 To review a score that is so classic, popular, and not the least, complex as John Williams' score for Star Wars is an extremely difficult task. At the same time it is also rather pointless to describe, and analyse, the score, as it is so well known and popular - every one knows what it sounds like - so I will try and focus on the new features of the special edition instead. Released in 1997, twenty years after the films' premiere, RCA Victor's expanded release includes enough goodies to make even the biggest Star Wars fan happy. 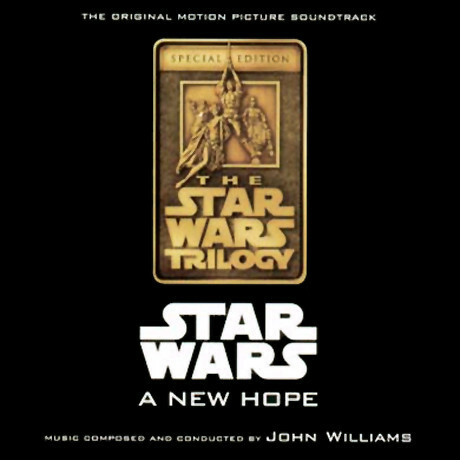 The music spans two full length CD's and includes three previously unreleased cues ("Learn About the Force", "Binary Sunset (Alternative)" and "The Death Star/Stormtroopers", and three cues with partly new music ("The Moisture Farm", "Attack of the Sand People" and "Imperial Cruiser Pursuit"). Opening with Alfred Newman's classic 20th Century Fox Fanfare, followed by the incredibly famous main title fanfare, this release takes us trough William's score in chronological order, exactly as heard in the film, without concert versions, which also is something a lot of people have asked for. The sound has been digitally re-mastered, and it's very good, although some minor tape hiss can still be found. Sometimes the sound is also rather "distant", meaning that the orchestra seems to be far away. But over all the sound is more than excellent, and it is definitely better than all the other releases of the score. This release also contains a hidden treasure. Tucked to the end of the first disc, after a couple of minutes of silence are all five recorded takes of the "Main Title". They are all somewhat different to one another. The first recording, for instance, has more woodwinds than the rest. Portions of the last three takes were used for the final version of the "Main Title". The liner notes are above all criticism. Lots of pictures, info and detailed comments on every cue makes the booklet one of the best ever produced for a soundtrack CD. Bravo! Over all, this is the best treatment ever given to a score, and everyone should have this classic score in their collection. Excellent, is about the only English adjective that can be used to describe this release of John Williams' classic score. The sound quality is considerably better than the anthology. The music is also sequenced into the correct order to follow the film precisely and so it is much easier to get a sense of what is going on as the music plays. The lucky coincidence that the two Cantina pieces fit into such a good place make them a good round out to the first disc. The previously unreleased material isn't anything that great, certainly it wouldn't have been missed as much as the unreleased Empire or Return of the Jedi music, but for completism, RCA Victor must get the full ten out of ten. The cues are also thoughtfully run together where applicable and there are few tracks that run for either too long or are too short. For me, some of the tracks on Empire seem too long, but this is never the case here. Not that it would matter anyway, the music is such a great experience, that as long as it was all there, I don't think I'd care that much anyway. The music, is, of course excellent and will take you through desolate sandy wastes, through thrilling action moments, through moments of quiet and of course moments of triumph. The alternate Binary Sunset cue is certainly noteworthy as it makes an interesting alternative to the original version using the Force theme, this hints at the force theme, but is less soaring, but more reflective and subdued. The alternate versions of the Main Title are interesting, although you'll probably get a little fed up after the umpteenth time you've listened to them, but picking out all the differences from the other versions you've heard is quite fun. All in all, an excellent release of a landmark score that truly shaped the way modern film music has evolved.